Join the networking event hosted by the British Chamber or Commerce Thailand on the third Thursday or every month; this month, February 18, hosted by Octave Rooftop Lounge and Bar! In a city that pulses at every turn, there’s no better place to take in all that Bangkok has to offer than from Octave Rooftop Lounge and Bar on the 45th to the 49th floor of the Bangkok Marriott Hotel Sukhumvit. This is the bar that brings to life the sounds, sights and skyline of the city every night. The comfortable and colourful setting is home to live DJs and chic crowds. As tantalizing as the views, Octave’s signature cocktails are a must. Showcasing the finest in wines and cocktails in town and new-age culinary creations like Asian-style small bites, Octave is effortlessly the hippest destination in town. 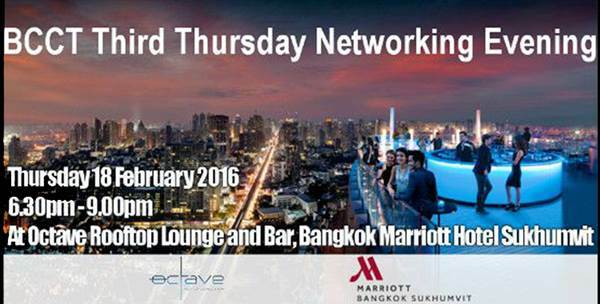 February's T3 is kindly sponsored by Octave Rooftop Lounge and Bar at Bangkok Marriott Hotel Sukhumvit. Cost: THB 400 for members and THB 800 for non-members including food, soft drinks, beer and wine.